Malcolm Moses Adams Brogdon (born December 11, 1992) is an American professional basketball player for the Milwaukee Bucks of the National Basketball Association (NBA). He played college basketball for the Virginia Cavaliers under Tony Bennett. As a senior in 2015–16, he was named the ACC Player of the Year and ACC Defensive Player of the Year, becoming the first player in conference history to earn both honors in the same season. He was selected in the second round of the 2016 NBA draft by the Bucks with the 36th overall pick. He went on to win the NBA Rookie of the Year Award, becoming the first second-round pick in the NBA to win the award since 1965. Brogdon, a top 100 recruit, committed to Virginia over offers from Arkansas, Georgia, and Notre Dame. He redshirted his sophomore year after suffering a serious foot injury the prior season. He was known as one of the top contributors to the team's successful 2013–14 and 2014–15 seasons. 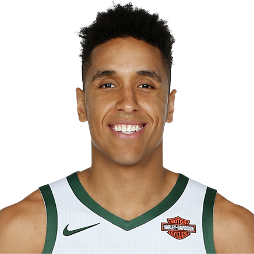 In the 2013–14 season, Brogdon averaged 12.7 points, 5.4 rebounds, and 2.7 assists per game. In 2014–15, he was named as a consensus second-team All-American, as well as the first-team All-ACC and ACC Co-Defensive Player of the Year. As a senior at Virginia in 2015–16, Brogdon was named to the 35-man midseason watchlist for the Naismith Trophy, and earned numerous prestigious awards, including ACC Player of the Year, ACC Defensive Player of the Year, first-team All-American, and a finalist for the Naismith Award. His college jersey number, 15, was retired on February 20, 2017. On June 23, 2016, Brogdon was selected by the Milwaukee Bucks with the 36th overall pick in the 2016 NBA draft. On July 30, 2016, he signed with the Bucks. He made his NBA debut in the Bucks' season opener on October 26, 2016, recording eight points and five assists in 21 minutes in a 107–96 loss to the Charlotte Hornets. On November 1, 2016, he recorded 14 points and four steals in a 117–113 win over the New Orleans Pelicans. On December 23, 2016, he made all seven of his shots for 17 points to go with seven assists in 29 minutes in a 123–96 win over the Washington Wizards. On December 31, 2016, he recorded his first career triple-double with 15 points, 12 assists and 11 rebounds in a 116–96 win over the Chicago Bulls. On January 8, 2017, he scored a career-high 22 points in a 107–101 loss to the Washington Wizards. On January 23, 2017, he had his second game of the season with four steals in a 127–114 win over the Houston Rockets. Two days later, he was named in the U.S. Team for the 2017 Rising Stars Challenge. On March 29, 2017, he recorded 16 points and nine assists in a 103–100 win over the Boston Celtics. He had six key points and two assists in the final 2:46 to help Milwaukee fend off a late Boston rally. 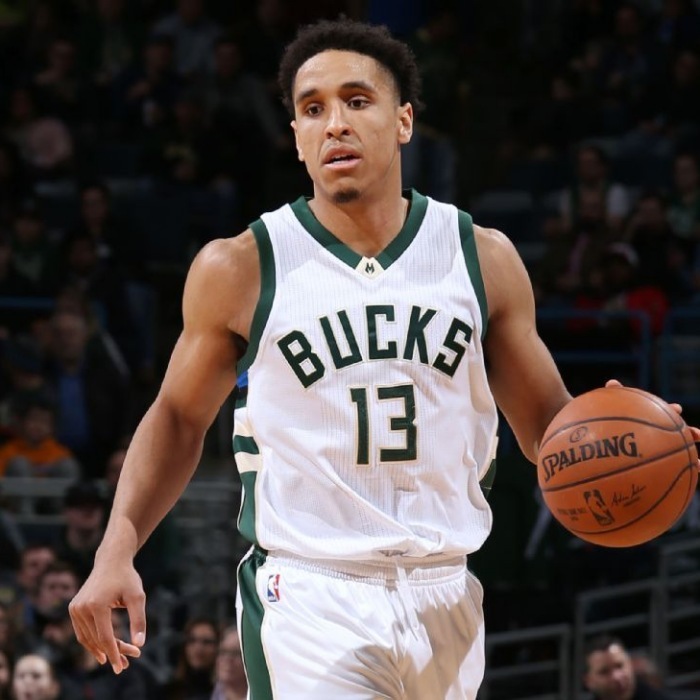 To conclude his rookie season, Brogdon was named the 2016–17 NBA Rookie of the Year, along with being a unanimous selection to the NBA All-Rookie First Team. Brogdon joined Kareem Abdul-Jabbar (1969–70) as the only players in Bucks history to win Rookie of the Year, and became the first player drafted in the second round to win Rookie of the Year since 1965. Brogdon averaged both the fewest points per game and fewest minutes per game of any winner in the award's history. In the Bucks' season opener on October 18, 2017, Brogdon scored 19 points in a 108–100 win over the Boston Celtics. On November 3, 2017, he had a season-high 10 assists to go with 21 points against the Detroit Pistons. Four days later, he scored a season-high 22 points against the Cleveland Cavaliers. On January 22, 2018, he scored a career-high 32 points in a 109–105 win over the Phoenix Suns. It was the first 30-point game for a Virginia basketball alum since Mike Scott in 2014 with the Atlanta Hawks. On February 2, 2018, he was ruled out for six to eight weeks after suffering a partially torn left quadricep tendon the previous night against the Minnesota Timberwolves. On April 9, 2018, he returned to action following a 30-game absence. He scored two points and played 13 minutes, all in the first half, in the Bucks' 102–86 win over the Orlando Magic. Brogdon represented the United States national team at the 2015 Pan American Games, where he won a bronze medal.